This book wasn't really on my radar, but I kept hearing such great things about it on Twitter. I'm so happy that I listened to those reviews because I loved this book! I haven't read too many space-y books, when compared to other genres, but I can't wait to read more of this genre and more of this author! Solara Brooks hasn't had the easiest life, but she has a plan to make her life better. However, that plan needs the assistance of a former classmate who wasn't friendliest. Doran Spaulding is the epitome of rich frat boy who always gets what he wants. But with a crazy turn of events, they realize that they need each other more than they'd care to admit, especially if they want to get back home. 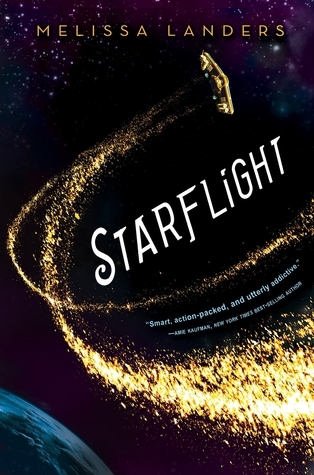 I haven't read too many space books, but I definitely want to try more of this genre. I love how each author can make it their own, as the possibilities are endless. Here, space isn't an undiscovered frontier. It's a vacation for the rich, and a new beginning for those with a bad past. I also like how the various planets are colonized and how that's discussed as well. I liked the romance for the most part. It was definitely not instalove, which is annoying. It's a slow burn romance that turns from hate to love. It just seems much more natural. Especially with their history, Doran making Solara's life miserable, and their current predicament. The one issue I had with the romance was Doran, and that was mostly his personality and that was mostly in the beginning of the book. The characters are all so different. Solara is the girl with a bad childhood who's trying to make her future better. Doran is the little rich boy who is a complete jerk. I just could not stand him in the beginning of the book. He was just so rude! Ugh! But it gets better at least. The ragtag ship crew that they meet up with are all unique as well. The captain's a hardy old man who will do anything to protect his ship and crew. His first mate is calm and smart, with a weakness for pick-pocketing. And there is a mysterious pair that are full of secrets. Overall, this book was a great surprise. I had a feeling I would like it, but I loved it so much more than I expected! I can't wait for the companion novel and to read the other trilogy by Melissa Landers. I can't wait to try more of this genre!